Growing up, blackberries grew wild in the wooded area across the street and all along our fence line. My mom would send my sister and I outside with a couple of bowls and a job – step 1 for blackberry cobbler. Warm blackberry cobbler with a melty scoop of Blue Bell’s Homemade Vanilla on top is probably the only thing that I’d ever pick over a chocolate dessert. It’s too bad that I no longer have a place to pick fresh blackberries but they do go on fire sale during the spring and summer months – plenty of time to work them into a pretty salad, a nostalgic cobbler, and a fun cupcake. The Classic White Layer Cake recipe from Cook’s Illustrated is proving itself to be a very versatile recipe. It’s my favorite white cake and has been engineered to produce what I believe to be the world’s best from-scratch strawberry cake. 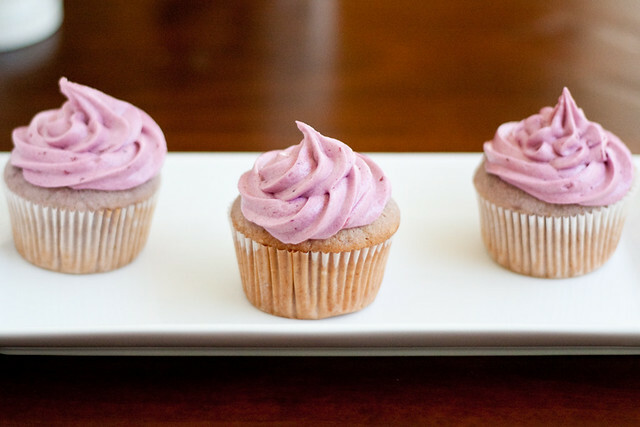 With some blackberry puree mixed into the batter and classic American style buttercream, it makes a fun purple cupcake with a hint of blackberry goodness. 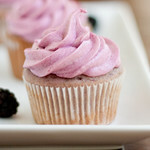 We added blackberry puree to our favorite white cake recipe and got a pretty purple blackberry cupcake. These sound delicious and I love the pretty purple color! I’ve never eaten a berry cupcake, but these are tempting me to try! Just gorgeous, Shawnda! Two things: You totally need to do a video tutorial on how you ice your cupcakes. I have one tried and true tip & method that work, but would like to expand that. Second, how do you think this icing compares to MS’s Swiss Buttercream that you’ve been using? Kat – 1. How ’bout I show you a good shot of someone else doing it 🙂 I use the Wilton 1M tip but any large star tip will do. 2. I adore Martha’s swiss buttercream frosting, it’s just more work and required egg whites that I didn’t have. I would have loved adding the blackberry puree to that recipe instead. So pretty! And blackberries are one of my favorite bite-sized fruits! Such beautiful and sweet treats! I love the way you iced your cupcakes too…visually stunning and I’m sure even more delicious. Thank you for sharing! If anything says spring to me, it’s these cupcakes! 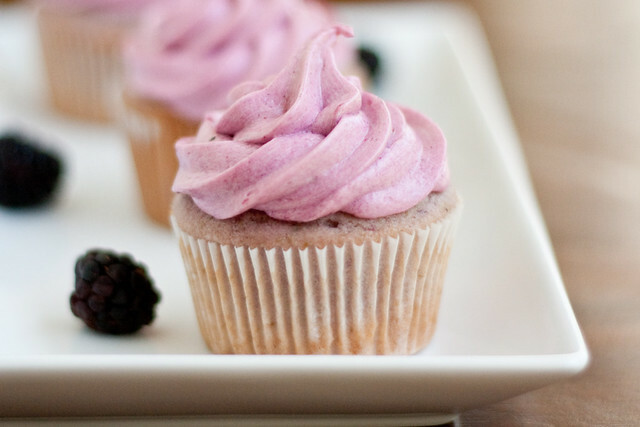 I love that the blackberries are in the frosting AND the batter…double the pleasure, double the fun. I am not a frosting fan, but I am loving this one. I can’t wait to try it! WOW! Really beautiful frosting. Great photos! i love blackberry frosting and blackberry ice cream. oh, those would be good together–what an idea. I’ve never had blackberry frosting! So excited to try this when blackberry season rolls around. So pretty. They are so very yummy! My husband and toddler love them! Did you mean “lemon juice” in the batter or vanilla? Michelle – thanks for noticing. I did mean lemon juice. So i noticed that someone posted something about the vanilla and lemon juice…so i AM supposed to use lemon juice in the batter NOT vanilla? Lemon juice goes in the cake. Vanilla goes in the frosting. These are too cute! I have been trying to figure out how to use of some blackberries I picked, and this might just be it! MY husband made this recipe into a bundt cake for my birthday last night. It was the best cake I’ve had and the color was incredible! I hope he makes it for me every year… Not a bad way to kick off your thirties. Do you have an idea for a dairy-free variation for the cake recipe? Obviously margarine in place of the butter, but what to use for a milk substitute that would work in the cakes? I’m afraid I don’t have any experience with dairy-free. Is soy milk a viable substitute? wondering if I could do 2 8 inches with this recipe? also do you think i could decrease the sugar? You can definitely make it in 2 8- or 9-inch pans. I have successfully made this recipe as a white cake, cutting the sugar back to 1 1/4 cup. How would you adjust the cooking time for 9″ rounds? Or even a 9×13? I need to cut it down once cooked into the a necklace pendant shape, so don’t think cupcakes are my way to go. Thanks! These cupcakes are my go to recipe when I need to people please! No matter who I make them for, they are beloved… you name the event and I’ve had requests for it! The birth of a child, a work potluck, a wedding, even! Thank you so much for sharing; I always refer friends and clients to your page! Just made these last night and have gotten rave reviews from my coworkers! My only question – mine are much darker than yours….any clue on why they’d be so much ‘purple-er’ than yours? I used roughly 2/3 C. puree in the batter, maybe a tiny bit more but not as much as a cup. Lisa – your berries were better than mine! All the color comes from the juice. I originally made the cupcakes with early, early season berries. Mid-summer berries are so much better! Happy to hear that you and your friends enjoy them so much! Bummer, David. I’ve never had that recipe get wonky on me. 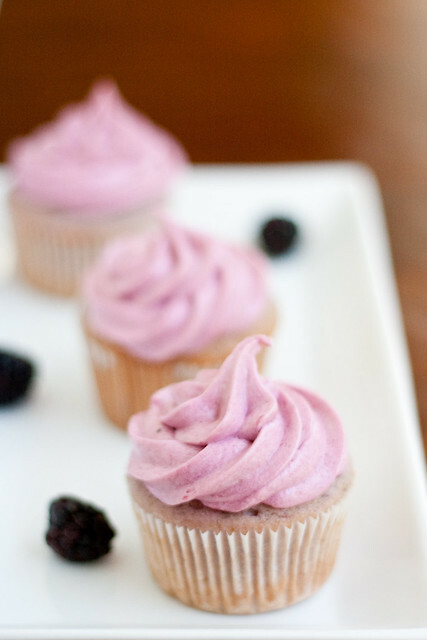 I made these cupcakes and they were delicious, I doubled the amount of blackberries in the cake and in the frosting and I did not strain the berries threw a sieve and they turned out great! OMG I just made this today and let me tell you they are amazing. I plan on making these again real soon. Thank you for sharing your recipe. I had a problem with the frosting, I creamed the butter and everything and added the powdered sugar and it was fine, but when I added the black berry purée to the frosting, it looked really funky and almost grainy looking like as of the butter and sugar were separating. I dunno if it’s the acidity from the berries or if it was the powdered sugar, but it went from smooth to grain right when I mixed them together 🙁 still tasted yummy but looked awful I dont know why? I just found my birthday cake for this weekend, thanks Shawnda! These were absolutely DELICIOUS!!!! Very moist and flavorful..thanks for the recipe! Can’t wait to try these. My daughter is having a birthday soon and she loves fresh fruit so were going to try these along with some lemon blueberry cupcakes and also strawberry ones. Just have to work on my frosting skills so they’ll be as beautiful as yours. Thanks again for sharing. These look gorgeous.I’ve featured this recipe on my blog, hoping that you don’t mind, but if you do, please contact me and I’ll remove it. All the best. Made these with blackberries from the farmers’ market and they were to die for. Family and friends gobbled them up. I made white cupcakes from a box mix and frosted with the additional frosting and they also were delicious. Thanks for the awesome recipe! It is now a family favorite. This sounds delightful. Do you think if I used the whole eggs with yolks that it would be ok (obviously less white too)? Or does something else need to be adjusted for that? I just can’t waste 6 egg yolks, and I have no idea what to do with just an egg yolk left over. But I really want to do the blackberry puree to the cake part. Thanks if you can help. You can use 4 whole eggs without any other changes, it might affect the color just a bit. Do you have to use the meringue powder in the frosting? Trying to stay as natural as possible, but I also don’t want to use egg whites. No – I use it for “crusting” but you can omit. I just made these with a lemon swiss meringue buttercream for Easter and they are to die for! I love that they have the pretty purple color without having to add chemical food colorings. Five star recipe thank you so much! I have quite a bit of frozen blackberry juice left from picking this last summer (left over from making blackberry jelly). Do you think I could substitute that for the purée if I reduce the amount to 1/2 or 1/4 of the blackberrys called for? I would like to use it for my daughters birthday. Yep, should work just fine!